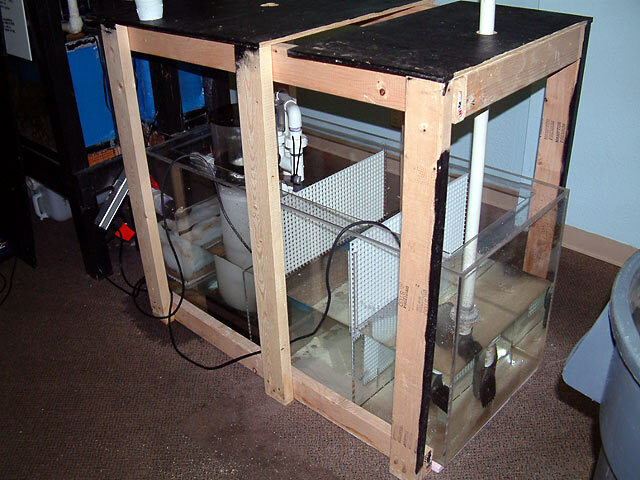 Glenn, a member of DFWMAS contacted me about a 34 gallon hexagonal tank he wanted to modify, and incorporate a sump with a refugium. This was a sump I built for a LFS near me. The challenge was making a sump big enough to hold water from about 20 tanks draining into it, and be able to handle a new shipment of livestock that arrives. All those bagged items quickly increase the total system volume. And then throughout the day, water is taken as each piece of livestock is sold, dropping the total system volume. A local vendor contacted me about building a new system to hold livestock as it arrived. They drew up the plans, purchased the materials and started cutting up the pieces. When I arrived, my job was to show them how to assemble the parts successfully. The project came out great in the end, but a lot of things were learned along the way. The top two sections hold 200 gallons each, the bottom on holds 250 gallons. 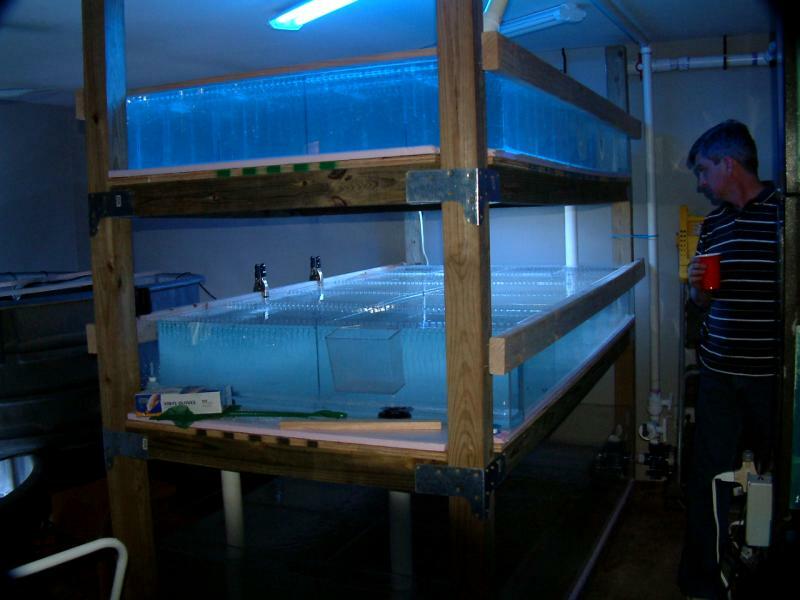 Peter, a member of DFWMAS wanted a large sump to consolidate all the smaller units he's been using under his 3' x 5' open top display tank. This tank was used last year at MACNA XIV, for Clam and SPS sales. Peter brought it home, and made an amazing SPS reef. Check out some of the pictures I took. 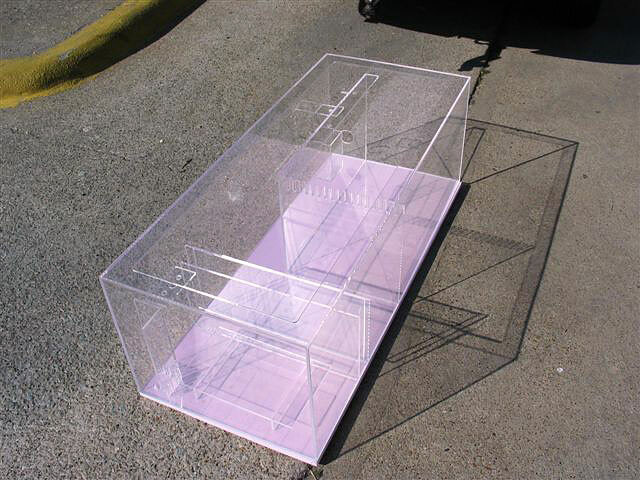 People ask if I'll build and ship a sump to their location, and I always forewarn them that is is very expensive. Here's why. The Model "G" External (formerly the Model G-modified) is a sump that allows for an external pump. If the sump isn't drilled, an internal pump can be used of course. The skimmer section houses the protien skimmer and bubble tower, and the large refugium allows the hobbyist to see inside easily. Water from both zones pours into the center area, and then flows behind the refugium zone to the external pump. The benefit of this design is the increased linear travel time that avoids issues with microbubbles.